Iranian Foreign Minister Mohammad Javad Zarif and his Swedish counterpart Margot Wallström sat for talks on Wednesday in the Swiss city of Geneva. During the meeting, which was held on the sidelines of the Geneva Conference on Afghanistan, the two sides exchanged views on Sweden’s efforts to resolve the Yemen crisis and mutual cooperation on international issues. 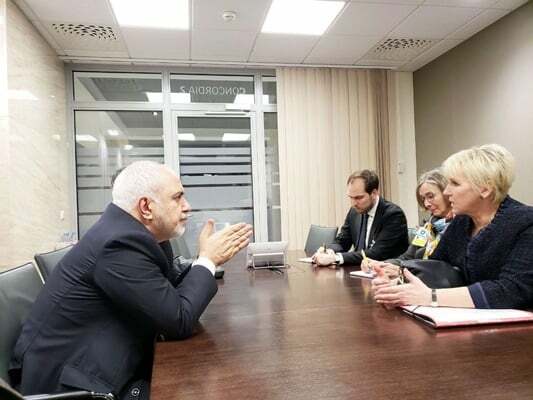 Zarif and Wallström also discussed the priority of holding international dialogue on the issue of human rights, and the need for international organizations to avoid taking arbitrary measures. They also underlined the need for the two countries to remain in close touch on various mutual, regional and international issues. The meeting came a few days after the two sides held a phone conversation on Yemen peace talks slated for December in the Swedish capital, Stockholm. The UN special envoy for Yemen is charged with brokering the talks. A previous effort to convene the talks in Geneva in September failed when the Houthi delegation was not allowed to show up.